Bilt-Hamber Gloss Enhancing Cleanser-Polish is an award-winning resin based polish that provides exceptional levels of mechanical refinement and cleaning for your vehicles paintwork. Used after claying to provide an optically clear, deep rich shine – it is an excellent all-in-one product. The treated surfaces are now resistant to environmental attack and also they are super-smooth, glossy and friction-free. Easy to use both in application and buffing – this product fills minor swirls, hologram-like scratches and minor defects. Where stone-chip damage penetrates to bare steel you should use it in conjunction with auto-balm. 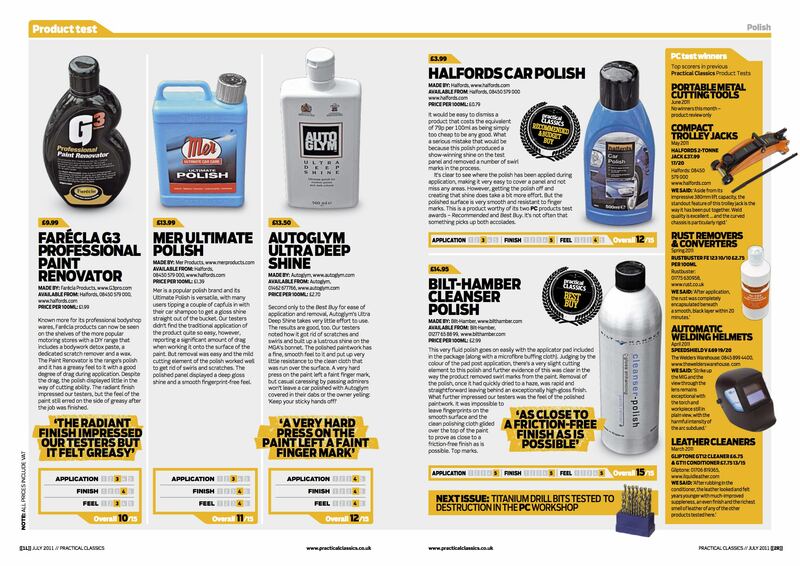 Click here to see the complete Practical Classics polish test. This was the only cleanser-polish that scored 15 out of 15! Wash the vehicle, preferably using auto-wash and decontaminate the paint using auto-clay if required. Use cleanser-polish in a cool shaded position, and apply using the app-pad in circular motions with light to medium pressure – increased pressure will remove oxidisation and light scratching. Allow to dry to a haze and buff to a deep shine with the microfibre cloth. cleanser-polish can be over coated with finis-wax, double speed-wax, auto-balm or hydra-wax and the finish maintained with auto-qd. Using finis-wax or double speed-wax will increase the depth of the shine, make metallic finishes look even better and dramatically increase the time before the paintwork next needs polishing or waxing. auto-balm will provide a deep, rich shine particularly suited to classics, it will provide even greater improvement to porous or otherwise degraded problem paintwork and prevent rust. Finally hydra-wax will provide super-easy application and buffing with an excellent durability increase and a deeper shine.